The fun never stops around here, in case you haven’t noticed…. 1. Tonight – September 1st – I’ll be playing at the Diner from 5 – 8. 2. After you come see me tonight, head over to Lohrwood for Karaoke! Speaking of Lohrwood, the lineup is awesome. Karaoke Friday night followed by music ALL day Saturday and Sunday. Pot luck, street parking – tons of friends. I’m playing Sunday at 12 noon. There is SO much local talent involved in this – you’ll be impressed. Stop by!! 3. I have the privilege of being the Interim director of this Year’s Christmas Cantata – Yarnell Community Presbyterian Church. Like to sing? Join us! The First rehearsal is Wednesday, September 6th at 6:30pm. Open to all. 4. Friday, September 8th – Walt Eckes will bring your entertainment at the Yarnell Family Diner! You never know who might be a special guest that night; Walt has a nice way of including other talent when available. 5pm – 8pm. 5. Also, Friday, September 8th – I’m performing at the Wickenburg Elks Lodge 2160, 5:30 – 8:30. 6. Saturday, September 9th – It’s a Happy Days Style Movie Night – Yarnell Assembly of God 5pm. Big Al’s Diner, Popcorn and the film Grease. You pay one fee for all: $10 adult, $5 child. Sponsored by the Yarnell Fire Auxiliary for the Honorary Mayor Candidate Jeff Shearer. See the attached flyer and share with your groups! Been a busy and fast paced summer – at least in my reality. Hope you’re all healthy and well! 1. This afternoon from 3pm – 6pm, I’ll be performing at VFW Post 541 in Prescott for their Oktoberfest in August. Stop by if you’re in that neck of the County. Happy Anniversary is in order too! August 15th is Wayne and Barbara Schlegelâ€™s Special Day – AND it’s also Lew and Marcie Theokas’ special day! Hope both couples will join us this week. 3. Saturday, August 19th – 10am to 1pm – Peeples Valley Fire Auxiliary is hosting a Community Picnic. All in Yarnell and Peeples Valley are invited. Burgers, dogs, potato salad, drinks, games for children and adults. FUN! 4. Friday, August 25th – Manzanita Road will rock the Yarnell Family Diner from 5pm – 8pm! Email: mail2leahtidey@gmail.com and jerryflorman@gmail.com and request to be placed on their lists! 1. Friday Night, August 4th – Join me at the Yarnell Family Diner, 5pm – 8pm for dinner and music by yours truly. 2. Saturday Morning, August 5th – We won’t stay out late on Friday, because we have an AWESOME Pancake Breakfast from 8am to 11am at the Yarnell Fire Station. Hosted by the Yarnell Fire Auxiliary to raise funds for the Honorary Mayor Campaign. 3. Wednesday, August 9th – 5pm at the Yarnell Community Presbyterian Church. WE ARE IN FOR A TREAT UNLIKE ANYTHING ELSE! Rock Springs Café, Black Canyon City, is a business owned by a true friend of Yarnell, Augie Perry. Rock Springs is noted for the best tasting pies this side of the Mississippi – even this side of the Atlantic! They are sponsoring a Pie Tasting at the church….Another awesome opportunity for the Yarnell Fire Auxiliary. So, $10 dollars gets you a taste of 3 flavors, add $1 for a la mode. Linda Ma says that left over pies may be auctioned off. So, who doesn’t like pie, coffee and ice cream??? That’s what I thought. So, see you there, 5pm on the 9th. (check out the flavors at Rock Springs Café website. 4. Friday, August 11th – Yarnell Family Diner welcomes our own Walt Eckes “Strings Attached” from 5pm – 8pm. 5. Friday, August 11th – My second Fridays are contracted each month at the Wickenburg Elks Lodge 2160 – I start between 5:30 and 6pm. They serve awesome dinners restaurant style. Not a member? Let us know and we’ll get you in as our guests. There is a limit to how many times we can do that, but if you like the place, we’ll sponsor you for membership. Talk to my Lou! He knows the ropes. 6. Friday, August 18th – I’ll bring the tunes at THIRD FRIDAY at the Yarnell Family Diner, which means it’s BIRTHDAY NIGHT – Trivia, free dessert for Birthday Babies, and often dancing if you choose. Happy Anniversary is in order too! August 15th is Wayne and Barbara Schlegel’s Special Day. 7. Ever heard of Christmas in July? Well this one’s a twist: Oktober Fest in August: I’ll be performing at VFW Post 541, Prescott from 3pm – 6pm on Wednesday, August 16th – Beer Garden and food, sponsored by the VFW Auxiliary. A little weeknight treasure. Veterans of Foreign Wars is a members only club, however – once again you may attend as our guests for this event. All we need to know is that you’re coming! 8. Saturday, August 19th – 10am to 1pm – Peeples Valley Fire Auxiliary is hosting a Community Picnic. All in Yarnell and Peeples Valley are invited. Burgers, dogs, potato salad, drinks, games for children and adults. Be there or be square…. Events, events and more events…..what can we say? Hope you’re all enjoying some of this rain. It was certainly needed, and there’s more to come. 1. TOMORROW, Friday, July 14th, 5pm: Walt Eckes, “Strings Attached” will bring on the tunes at the Yarnell Family Diner. 2. Also, tomorrow, the 14th, 5:30pm, I will be playing at the Wickenburg Elks Lodge 2160. Full dinner served. If you’re not Elks member and you’re around that area tomorrow, just let us know you’re coming. You can be our guest. 4. Friday, July 21st – it’s THIRD FRIDAY BIRTHDAY NIGHT at the Yarnell Family Diner! Our very own Walt Eckes will be bringing the celebration music for your birthday enjoyment. 5pm – 8pm. 5. Also, Friday, July21st – I’m playing at the Prescott Valley Elks Lodge 330 at 5:30. Full Dinner Served. 7. Friday, July 28th – Manzanita Road at the Yarnell Family Diner from 5 – 8pm. These are just some highlights! Did you know that you can get more event information by writing to Leah Tidey? We have similar email lists, but she often provides different events and public announcements. mail2leahtidey@gmail.com. That’s all from entertainment central for now….have a great weekend! Hey, Friends! Keeping your cool? It’s been a busy time, but there’s some insanely fun events approaching. Get your calendar pen ready! 1. Friday, June 30th, 4pm – A Remembrance of the Lives and Sacrifice of the Granite Mountain Hotshots, and the victims of the Yarnell Hill Fire, 4th Anniversary. 4pm Yarnell Assembly of God. 2. Friday, June 30th, 5pm – Manzanita Road at the Yarnell Family Diner -Music and Dinner. 3. Friday, June 30th, 5:30pm – I’ll be at Prescott Valley Elks Lodge #330 – Music and Dinner. 4. Saturday, July 1st, 3:30pm to 7:30pm – Honorary Mayor Race Kickoff at LOHRWOOD: (corner of Hackberry and Walnut in Yarnell). BRING A CHAIR OR TOWEL: Music by BLUZONE, an awesome blues group that requests your presence to jam with them and also to bring a list of songs! $10 entry donation + food donation. 6. 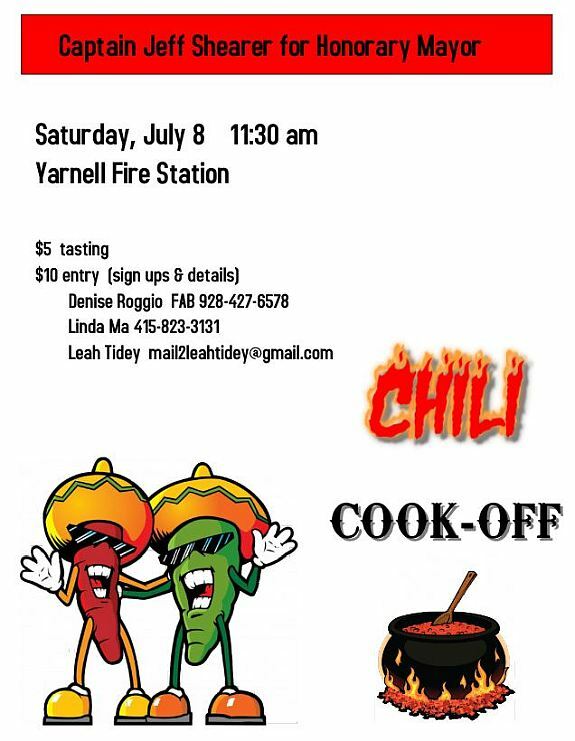 Saturday, July 8th – CHILI COOK OFF! Jeff Shearer is running for Honorary Mayor to support the Yarnell Fire District. The first event is gonna be amazing. $10 entry fee, $5 tasting. Got great Chili? Email me for more details, or call Linda Ma, 415-823-3131. Attached is a flyer. 11:30am til ? at the Yarnell Fire Station. Prize for the Chili winner! Flyer below. Be safe, friends. Wildfires this year in our state are Tremendous with no rain in the forecast. Be aware the ignition factor is dangerously high. Well, the Yarnell Memorial Run was a huge success! More than $11,000 was raised, and many of you helped. Though we’re all grateful, I personally am blown away. Thank you! And now that it’s finished, I’m able to write and share some upcoming events with all of you. I’ve taken a bit of a music hiatus while Lou and I make a life transition into our new digs a little at a time…. Friday, June 23rd – you get me again at the Yarnell Family Diner. Friday, June 30th – Manzanita Road will rock the same joint! Friday, June 30th – I’ll be at the Prescott Valley Elk’s Lodge 330 from 5:30 to 8:30, full dinner served. This is the place with a huge dance floor and very friendly people. If you’re in the area, stop by! The Kickoff for the Yarnell Honorary Mayor Campaign is scheduled for July 1st. I’ll update you with more details when I receive them. Lots of fun summer events are being scheduled, so you’ll want in on it. The Mayoral Race raises money for all the organizations that have a candidate. It’s a ton of fun! Info for other events is available by being on more lists. Two in particular: Leah and Jerry: mail2leahtidey@gmail.com and jerryflorman@gmail.com. Leah will send out information as it comes in, including a community calendar. Jerry will update you regarding the Yarnell Community Calendar and Club Yarnell events. Shoot them a message to get on the list! 1. Tomorrow, Friday, May 26th Manzanita Road at the Yarnell Family Diner from 5pm-8pm – They are wonderful! Check them out. BBQ and Drumming at Mike Manone’s Lot on the corner of Hwy 89 and Foothill Lane in Glen Ilah, Yarnell. Party starts at 5pm, he’ll BBQ whatever you bring to eat at 6pm, bring drums/percussion instruments, a flashlight and your own chair plus your own beverages of choice! Let me tell you the story behind the drumming, because I’m so excited about it. My son and daughter live in Virginia and New Jersey, respectively. I have tried so hard to describe the Yarnell tradition of a “drumming” to no avail. For the first time since I’ve moved here, my daughter, Kam (Kamille) and her friend Abby, are coming to visit for this long weekend. We asked Mike if he’d host a drumming for two reasons: firstly, it’s something everyone should experience at least once; secondly, I want my daughter to meet the coolest people on the planet – that’s YOU. Thanks to Mike for putting it together, I owe him dessert…..
On to the following week! Monday, May 29th – Happy Memorial Day as we remember lives lost for the sake of freedom. 11am at the Genung Cemetery in Peeples Valley, American Legion Post 79 will host a Memorial Service. From 12pm – 3pm there is a Patio Party at the Legion – open to the public, hosted by the Sons of the American Legion. There are many things going on in town. Club Yarnell has been busy – contact jerryflorman@gmail.com for up to date information on Club Yarnell. Also, make sure you’re on Leah’s email list for so many other events: mail2leahtidey@gmail.com. Okay, I hope to see you Saturday night! Hope you had the opportunity to enjoy Yarnell Daze this past weekend. I’m working on the June schedule for entertainment at the Yarnell Family Diner, so for now we’ll talk about the rest of May…. To begin with, this Friday night, May 19th is the Third Friday Birthday night at the Family Diner! 5pm – 8pm, I’ll be playing. The party usually begins around 6pm. Remember that birthday babies get a free dessert. We can dance and play Trivia, provided by one of the May babies – Leah Tidey. Friday night, May 26th at the Diner, Manzanita Road’s Tim and Terry will bring you their talent – they’re excellent if you’ve never had the chance to hear them. 5pm – 8pm. Don’t forget the Yarnell Memorial Run, Saturday, June 3rd. Opening ceremony at 6:50am, lots of raffles including a 50/50. Even if you’re not a runner, come join the gathering and cheer them on! Did you know that Yarnell has a bed and breakfast? Share this with your friends: Mountain Breeze Az. Our Chronic Pain Series begins May 18 at 1:30 ( please register for this series). We have a Cancer Awareness Seminar: Living with Cancer Session on Fri. May 26 at 1:30. A Cancer Oncologist Nurse, Dawn Bassett, is coming up to guide us through some of the mysteries of Cancer and treatments. Come with questions! Contact jerryflorman@gmail.com for information regarding Club Yarnell Events. Okay, I will be in touch soon with June info! Until then be well and enjoy your week. 1. This Friday, May 5th: Strings Attached, Walt Eckes, will entertain you at the Yarnell Family Diner. 5pm – 8pm. 2. Also, this Friday, May 5th, I will be at the Prescott Valley Elks Lodge 330 from 5:30 – 8:30. They also serve dinner. 3. Saturday, May 6th at 2pm! Ice Cream Social at the Yarnell Fire Station. This is for Community Wildfire Preparation Day, and there is some really good information for you. It won’t take much time out of your Saturday and will be way worth it. If nothing else, you’ll get Ice Cream with all the fixin’s provided by the Yarnell Fire Auxiliary – $2 suggested donation. 4. Friday, May 12th – In preparation for Yarnell Daze, there will be no music at the Diner, but there will be…. 5. May 13th – MUSIC EVERYWHERE ALL DAY! Yarnell Daze Mountaintop Festival. There will be music at the diner, music at the vendor’s stage on 89 & Happy Way, music at the beer garden…parade, fun and food. 6. Friday, May 19th – THIRD FRIDAY BIRTHDAY NIGHT AT THE DINER! 5 – 8pm, Trivia, birthday baby dessert for free, dancing and celebration. Happy Birthday to all these fine people! 7. Friday, May 26th – Memorial Day Weekend Begins with Manzanita Road at the Yarnell Family Diner. I LOVE this time of year, good weather, light out early, dark comes later, and the humming birds and doves are all over my yard. Hope you’re doing well. SO – to recap upcoming events, and to share an item I missed last week, here’s the lowdown. Make sure you mark your calendars for the May and June alerts too. 2. Friday, April 14th – I’ll be playing at Elk’s Lodge 2160 Wickenburg from 6pm – 9pm. You’re always welcome! 4. Sun, April 16 – Happy Easter!! 6am SHARP is a glorious Easter morning early service at the Old School House on Hwy 89 in Peeples Valley. Early sunrise service as the sun breaks over the mountains. Then head over to the Presby Church for a FREE, yes, FREE breakfast of casseroles and pancakes, coffee, OJ at 7am. 5. Saturday, April 22nd – Trivia Night for Petey’s Playground! Where: Yarnell Fire Station. Time: Doors Open at 5pm, Game Starts at 6pm – Bring a Fist Full of Dollar Bills, Gather a Team or come alone – $20 per person, tickets available at the Muleshoe in Advance. Call Kim Lytle 928-713-1375, Light Dinner will be served. I hear there’s a Disco Team that’s donning their 70’s garb. That may be a must see….hmmm. Too bad I’m booked for a 25th wedding anniversary that night, sounds like a blast! 7. Saturday, April 29th – Playing at the Bomar’s Pig Roast Luau! Community Presbyterian Church Annual Rummage Sale – Friday April 28 and Saturday April 29 – 8AM to noon. We will have furniture, adult and children clothes, kitchen supplies, and household items. All items are sold by donation only. Come and find some fun treasures and enjoy a slice of home baked pie with coffee after you browse and buy! If you don’t find a treasure just come in and say hi. All of our proceeds stay in Yarnell to support our local Meals on Wheels and our Food Bank. Saturday, May 6th at 2pm – Come to the Yarnell Fire Station for an Ice Cream Social hosted by the Yarnell Fire Auxiliary. You do NOT want to miss this. That day is heralded as Wildfire Preparation Day. Bruce Olson, who is overseeing the 2017 Fuels Mitigation Program, wants to share some important information with the entire community. Donations for the Auxiliary will be accepted. This is an excellent way to find out what is happening from a Wildland Firefighter perspective, and what you can do to stay Firewise. See you there. Yarnell Daze 2017! May 13th, all day, parade at 10am, everywhere in town. Check out the Beer Garden, the Vendor’s Field Entertainment Stage, the Car Show and the ART Show- you will be impressed!